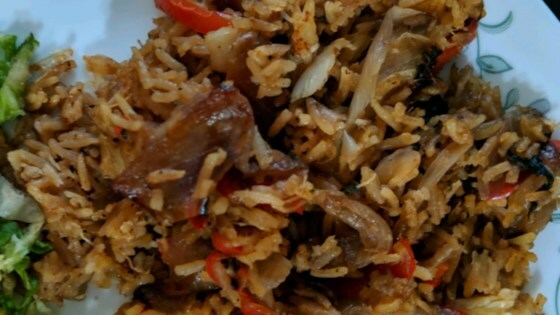 "This fried rice is very easy and so popular for Thai and Chinese. Try this recipe and you'll find it is very nice taste. Serve with chili in fish sauce or called in Thai 'Nam Pla Prik.' Enjoy!!!" EXCELLENT! This is great with cucumber and lime, without cucumber and lime, with cucumber, without cucumber, with lime, without lime, I was truly amazed at how easy AND tasty! Delicious stir fry. I used imitation crab meat which was very good. I think the cilantro really makes it. Would recommend any time! Wonderful recipe, both my husband and I enjoyed it. I did add a little soya sauce but otherwise followed the directions. We had it would some left over chicken curry and a salad. Will make again.